The nature of sport is that after a victory there is invariably another mountain to climb, another team to assess and analyse, and another plan of action to deliver. After last Sunday's important Connacht final win over Roscommon in Hyde Park - people quickly asked: "Who do we play next? And when and where will that game be on?" The answers are that Galway will face either Kerry or Cork (Munster champions ) in Croke Park on the weekend of July 14/15. Team manager Kevin Walsh and his squad will prepare for that fixture after they first enjoy their four point win last weekend. Provincial medals needs to be savoured, and a second Nestor Cup in three years, 20016 and 2018, is an achievment to be lauded. 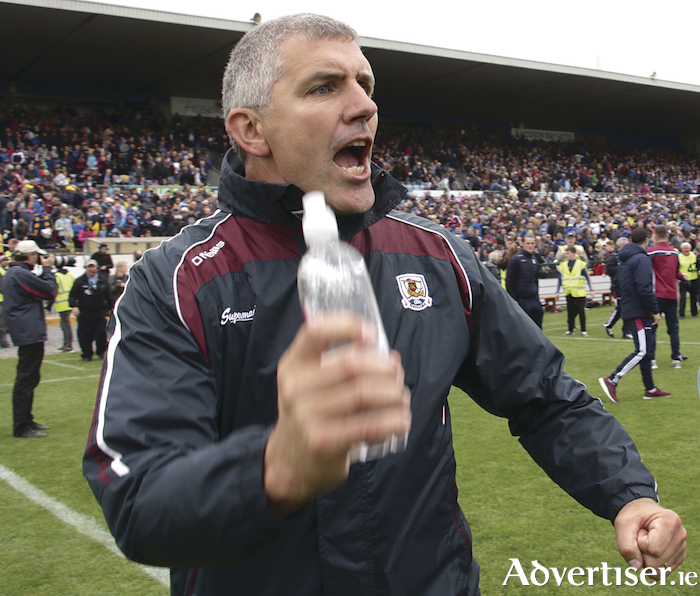 Galway lacked composure and intensity in the first half, and coughed up far too many soft turnoevers, but they improved immensely in the second half. "Our lads just want to get better. We had a bad first-half last weekend, but we got better on the second-half and we’ll assess that better during the week. “It was important to show who we are last weekend. If we were beaten by a better team on the day, so be it. However, now we’re the first team to make it to the Super 8s, so maybe it’s a bit of legacy in itself. “We’re still trying to learn from all these teams. We’re into the Super 8s and we’ll have a few weeks’ break, which is nice. The lads are back to club football this week." After the opening 22 minutes, Roscommon led by 1-04 to 0-2, but two quick fire points from Ian Burke stopped the rot, and Galway rallied a bit from there to go in at half-time 1-05 to 0-5 behind after a late Shane Walsh free. “We’ve found our way out of holes in the past as well. I know everyone keeps coming back to the one or two bad performances in the last three years. However, there were a lot of good performances out there. There are times, like last Sunday, if you play like we did in the first half and you keep playing like that, giving away all the turnovers, you’re heading for a nine-point defeat. "We were off-colour at that point and it is something we addressed at half-time. But, in the long run, it’s probably a good thing to experience, that these boys had to knuckle down and dig back deep. When the penalty came again after going two points up - it’s tough when those things happen - but in fairness, you put your faith in the lads and it’s a good experience now to have to dig that out. "We had a lot of turnovers and it put us on the back foot for a lot of that first half. We got in at half-time and had a stern enough chat, and you can’t say anything but good things about the lads in the second half. With a minimum of three more big championship games to come - two in July and one on the bank holiday weekend in August - the players will know a lot more about themselves and where their season is going to end at that stage.